This comfortable walk out ranch sets on 5 acres and has approximately 3000 finished sq. ft. Main level houses 3 bedrooms plus 2 full bathrooms including the master. Additional rooms on the main level consist of the formal dining area, great room, kitchen with eating space and laundry room. Nice deck off eating area to enjoy those sunny Colorado mornings! Along with a large L shaped family room, there is an additional bedroom and bathroom located on the lower level plus nice unfinished storage space. 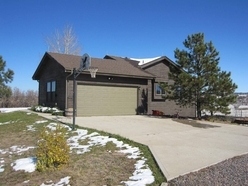 Located in the Christy Ridge subdivision, 10 minutes from downtown Castle Rock. No out buildings, therefore no livestock. Owner prefers no pets.